Passion: A great angler has a tremendous passion for fish and fishing. They enjoy the process of selecting gear, preparing for trips, and creating lures. Business Sense: A great angler has a keen business sense and runs a boat that produces quality experiences but is also organized and efficient. Attention to Detail: A great angler pays close attention to detail. Fishing is a science and every ingredient and measurement has a specific role that a fisherman must be continually aware of. Team Player: A great angler understands that he or she is part of a larger fishing team and that everyone must work harmoniously to ensure the timely production of quality fishing. Anglers must also work well with other boats and authorities. Practice: A great angler knows that fishing requires technique and skill that must be honed after years of practice. 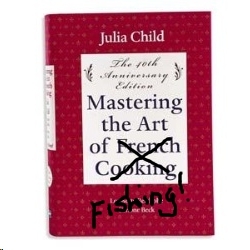 A great angler never stops perfecting his or her technique. Multitask: A great angler is adept at handling many tasks at once. A single angler might be responsible for several elements of a trip that all need to come together at the same time, and he or she must be able to ensure everything is completed at just the right moment. Commitment to Quality: A great angler is always committed to preparing the highest quality experience. They seek out the finest ingredients and use the best techniques to deliver the best product possible. Quick Decisions: A great angler is able to think quickly and can make good decisions when problems arise. Because of the timely nature of catching fish, problem solving must be done quickly to keep operations flowing smoothly. Handle Criticism: A great angler can handle criticism. Not everyone will always like what an angler says, and a good angler knows not to take it personally. As an author, I especially like that last one! I hope I never get so old and so stubborn that I refuse to learn. Just as good cooking requires experimentation, it’s important to get out and go fishing to see what works. I never want to be that internet troll that just sits around behind a keyboard and criticizes the words of others. That applies to everything, not just fishing, but this is a fishing website. We’ve seen a warm up this weekend, but the last few weeks have been incredibly cold on the Chesapeake Bay. Some of the ice has melted, but water temperatures are still just barely above freezing. Most of the rockfish have moved into deep holes along the original Susquehanna River channel. They’ll stay there in a semi-dormant state until things warm up. As a result, the gill netters are having one of their best seasons ever. 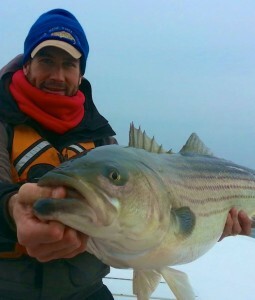 Since the fish are thick and concentrated, most of netters have moved up to larger mesh this winter in order to get the bigger stripers out of the schools. As you know by now, Maryland officials have allowed a 14% harvest increase this year. Some, if not most of the commercial license holders have already reached their quotas for 2014. So much for that “more-18-inch-fish-from-the-2011-year-class” theory. 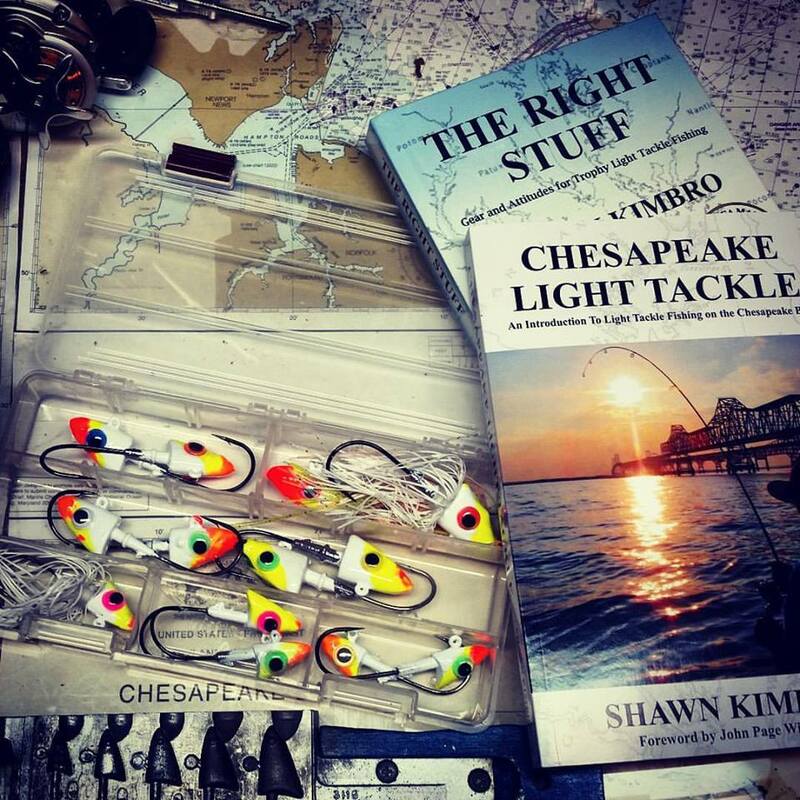 It’s worst case scenario for Chesapeake striper populations. More fish out of the spawning stocks means less fish for the future. To make matters worse, there’s a bill moving through both the Maryland House and Senate that would allow power-dredging of the oyster bars above the Bay Bridge. That’s right, the very foundations of the Chesapeake ecosystem are in danger of being leveled. At my talks this year you may have heard me mention a growing availability of 3D oyster bars. By that, I mean bars where oysters have been allowed to grow enough so they form plumes where tiny aquatic species can hide. Dredging destroys these 3D bottoms and eliminates the most valuable habitat in the Chesapeake Bay. I really hope more of our watermen can figure out the transition to aquaculture since that’s where the real money is now. Unfortunately, our wild oysters are almost gone. Oyster farming gives back to the Bay, while wild harvest using industrial methods like power dredges takes more and more away. 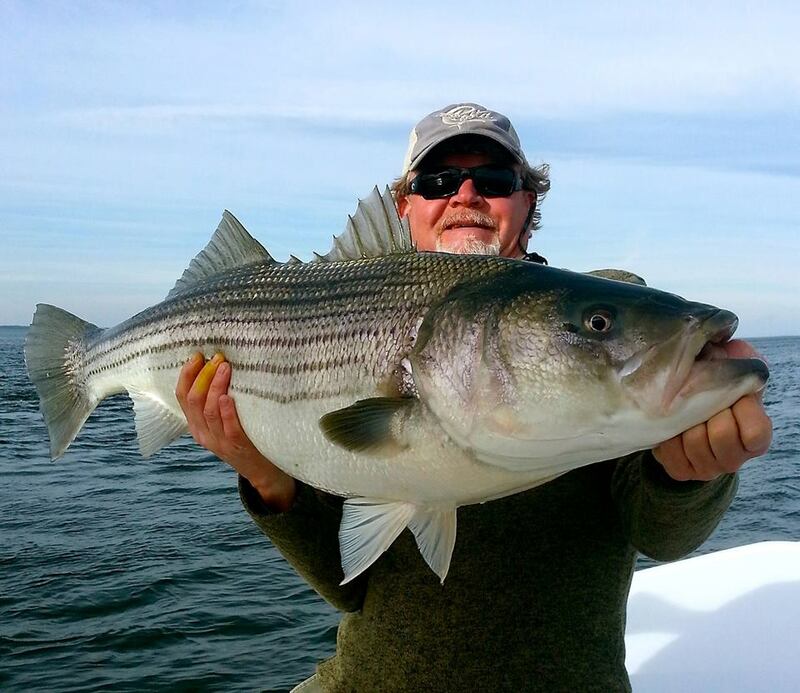 If you fish the Upper Bay or care about the basis of life for the Chesapeake Bay, please join me in Annapolis on Friday, February 28th and tell our representatives that recreational anglers count too! Bad news aside, there are a few rockfish being caught here and there in the warm water discharges and around the Bay Bridge. Although I haven’t had a single day where I’ve caught more than five striped bass this year, my fishing partners and I have been fortunate to land an occasional very nice fish. Yellow perch are now staging in the deeper holes near the spawning grounds. A good tip for finding a productive perch hole right now is to look for the last deep spot as you move upstream toward the heads of the creeks. Now that the ice is moving out pickerel fishing is improving and the best fishing spots are a lot easier to reach. Here’s Jeff Little of Blue Ridge Kayak Fishing with a beautiful 44.5″ striper he caught on my boat Thunder Road last week. He also caught the 42.5″ fish pictured at the beginning of this report. 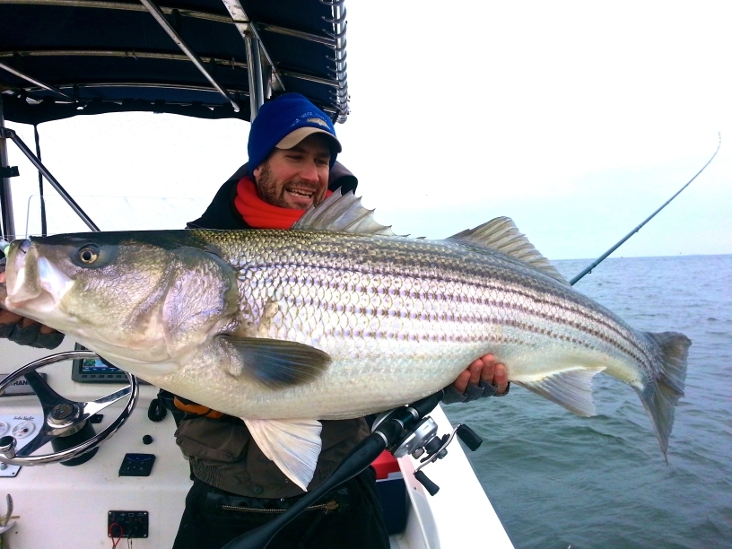 It was a tough day, but Jeff – who also happens to be a cook and a nutritionist – pulled out every ingredient in his recipe book and landed his two best ever rockfish. Good luck fishing… and cooking! -I thought the point of the new quota system was that waterman would not immediately catch their quota since it’s no longer a derby style fishery and to not flood the market and depress prices. Did that backfire? Yes, it’s only one year, but I think it backfired, Frank. With the fish so piled up and easy to catch, everyone caught up their quota very fast. A lot of people bought (leased) other people’s quotas and caught them too. This flooded the market and the price dropped. I was still seeing boats out everyday as of yesterday, so apparently some still have fish to catch. I like that video. I met some of those guys in Rhode Island last year. I just learned today that some commercial netters that have caught their are soliciting license holders ( some of whom hold licenses but have not fished) to go out on their boats and use their quotas on a percentage basis. Watched the Video on Jeff’s PB ,what a fish,very nice!